What is making your food taste so good? It could be the fresh ingredients, including the herbs. But, herbs are not just used for cooking – they’re also useful as household remedies and cleaning products. Herbs have been around for centuries in many capacities. You may be aware of their ability to add new and varied tastes to your food dishes. If you’ve never been much into using them for anything else, there is another world out there where homemade medicinal remedies utilize herbs. Some of the ones that you see on the following list could do double duty in the kitchen and the sick room. Basil – Most often used is sweet basil. Use it to season meats and vegetables. It has a flavor similar to cloves. Anise – The seeds are used for salads and baked goods. The leaves can also be used for meat and salads. Tastes like licorice. Chives – Have an onion flavor. Used in salads and on vegetables. Dill – Known for use in making pickles, but also popular for dressings. Use leaves in salads and as seasonings on fish, meat and vegetables. Garlic – Chopped, minced or as a spread, it flavors meat and vegetables. Oregano – Used in Italian and Mediterranean cooking. Common on pizza, in soups, sauces and on vegetable dishes. Mint – Used as a flavoring for mint sauce. Use the leaves in teas as a soother. Parsley – Mostly used as decoration on dinner plates. It can make a seasoning for soup and salad. Thyme – Found in the mix of herbs used in Italian cuisine. Sage – This herb is used the most around Thanksgiving and Christmas. It flavors poultry as well as stuffing and dressing. Savory – Found in dishes that contain egg, soups, sauces and green beans. Rosemary – Great for seasoning lamb and poultry. Marjoram – It is found in the Italian mix of seasonings. Use it to flavor meats. Coriander – The seeds are used in stuffing and curries. It tastes like orange leaves. The leaves are used in Asian and Mexican cuisine. Chervil – Can be used as a garnish. Often mixed with salad greens and in soups or omelets. Fennel – Used to season fish and sometimes found in sauces. You can use the leaves, seeds and stems. Tarragon – This is a French herb. It is an ingredient in tartar sauce, chicken dishes, some seafood and it can flavor vinegars. Sorrel – An acidic-tasting herb that is used in soups and sauces. Cilantro – Used primarily in Mexican cuisine for salsa, rice and meats. 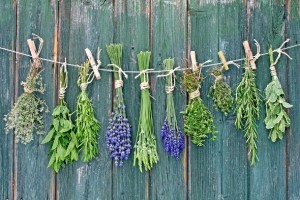 How many of these herbs do you have in your kitchen? Use fresh and dried for your cooking purposes.